Justine looks up to her big brother, Gary, in more ways than one. When we visited at the end of the summer, she was entering the “big school.” She knew she would need his support and guidance more than ever! Gary and Justine attend a school in the middle of the Pine Ridge Indian Reservation in South Dakota. The school is named after one of the Oglala Chiefs who believed education was the answer to a better future for their people. His belief led others to bring that vision to reality. The school operates a preschool, a kindergarten, and all grades through high school. The student population is around 900 students with a staff of about 200, who are predominately Oglala tribal members. Justine was excited to open her bag of school supplies. Her mother, Mert, knew that school registration was just around the corner. To get a jump start on the supplies her children needed for school was a good thing. The small town they lived in didn’t have much for shopping. There was a gas station, which included a convenience store, and a small grocery store that carried basic items. The items included in the American Indian Education Fund (AIEF) Program’s School Supplies service would help both Gary and Justine get a good start on the supply lists they were sure to receive from their schools and teachers. Smiles were evident on the faces of the students and their parents. 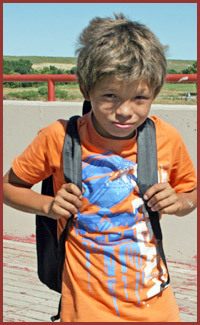 They knew that they had already saved a lot of money receiving supplies and a backpack! These savings would not only help buy more supplies, but also help with the gas money that it takes to get to a larger community with a better-stocked discount store. Saving money by comparison shopping on basic purchases can be a difficult task in rural and isolated areas with little variety. The 2015 report out by Huntington Bank shows that the costs of school supplies for students in Gary and Justine’s age group have increased in the past year. This percentage is likely higher on Indian reservations since the survey was conducted using supplies purchased at a national discount store in urban areas. 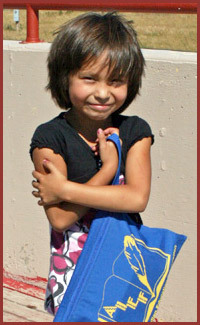 Nearly 26,000 Native American students received school supplies this year. At least two students were already thankful they had the tools they needed to get a head start on their elementary education.